Acumatica Pricing and ERP Pricing - Per Module? Per User? Per Transaction? Acumatica Pricing and ERP Pricing – Per Module? Per User? Per Transaction? Thoughts on Acumatica Pricing and ERP pricing in general. Should it be per module, per user, per transaction? Or maybe something even crazier like the average BMI (Body Mass Index) of the customer’s employees? 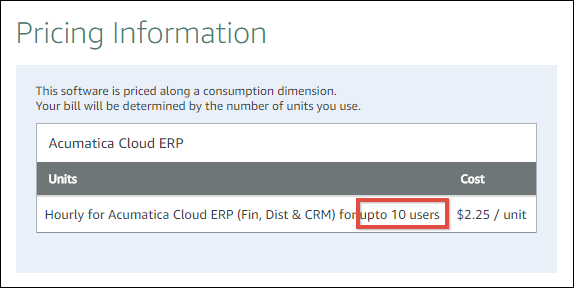 Acumatica has a unique pricing model for ERP companies in that they don’t price per user. Acumatica often touts that their licensing includes unlimited users, which I think is really cool. But there has to be a catch right? Until this year the catch was that the Acumatica SKU you purchase gave you a certain amount of processing power in terms of CPU, RAM Memory, and Storage Capacity. Now that has changed to a model that is based on transaction counts or document counts. The idea is that this will be easier for customers to understand. Also, from what I hear, other Cloud ERP vendors like NetSuite and Sage Intacct are already using similar pricing models. This change from Acumatica got me thinking about ERP pricing in general. Before I proceed, I have to get something out of the way. I hate pricing. I think it’s evil. Also, I’m not good at pricing. It makes my head hurt. Price is completely disconnected from cost. People who are good at pricing can make tons of money which feels wrong to me. Maybe that makes me a socialist. Actually, I like socialism. I just don’t think that humans can implement socialism on their own without communism which doesn’t seem to be any different than a dictatorship. Ok, now that I got that out of the way, let’s proceed, understanding that these are thoughts on ERP pricing from a person who isn’t good at pricing and thinks that it is evil. Historically, it seems that most ERP companies priced per module (General Ledger, Inventory, Manufacturing, etc.) or per user. Or a combination of both. Acumatica, founded in 2008, had a unique pricing model in that it was based on processing power. This is very similar to how Amazon AWS and Azure price their platforms. 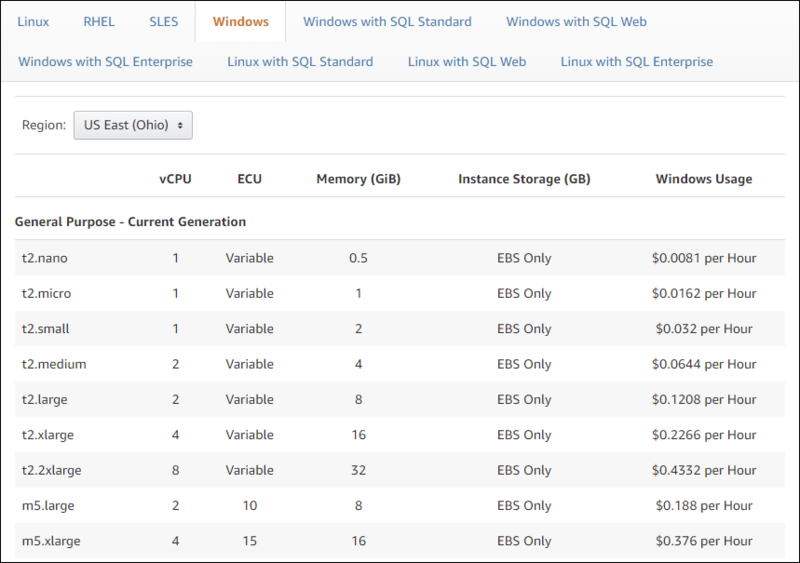 Here is a screenshot from the current Amazon AWS pricing page showing a per hour price for a Windows virtual machine based on processing power and storage capacity. When Acumatica announced a while back that they would be available in the Amazon AWS Marketplace, it seemed like a perfect fit. I assumed that the Acumatica licensing option tiers which looked similar to the tiers in the screenshot above would now be available on an hourly compute basis. That seemed like a cool modern way to do ERP. It even made me wonder if we might see something crazy in the future like Amazon acquiring Acumatica. I mean, hey, why not, they’ve gotten into so many other areas. But when you look at the pricing for Acumatica in the Amazon AWS Marketplace, it didn’t quite turn out that way. Here is a screenshot off of the current Amazon AWS pricing page for Acumatica with my highlight. If you look at the screenshot above, you can see that the pricing is hourly which is great, just like those Windows virtual machines above. But I was expecting to see multiple tiers based on processing power. Note though the highlighted 10 user limit in the screenshot above. And you can’t see it in the screenshot, but those are 10 named users, not 10 concurrent users, which effectively makes this an option for only very small companies, not the kind of companies that need to leverage a full blown ERP solution like Acumatica. This came out quite a while ago (I don’t exactly remember when) and I was initially excited until I saw that there were no processing power tiers like I was expecting. The 10 named user limitation made this seem like just a marketing move, not anything serious. Why didn’t Acumatica go with processing power tiers in their Amazon AWS Marketplace offering? Maybe the $2.25/hour Acumatica SKU tier would be comparable to the $0.0644/hour Windows SKU tier listed above? Then there would be another tier, maybe at $7.00/hour that would be comparable to the $0.2266/hour Windows SKU tier listed above. Wouldn’t that make sense? Maybe, but pricing doesn’t always make sense. I have no inside knowledge of how the whole Amazon AWS Marketplace offering came about. So I’m free to speculate. Remember, this is speculation from a person who isn’t good at pricing and thinks that it is evil. My guess is that Acumatica didn’t want to have a pricing model that was comparable to a hardware + operating system pricing model. Why? Because no one wants to become an operating system or, even worse, hardware, because those products have become commodities, meaning their price only goes down, never up. Let’s step away from Acumatica for a minute and just think about ERP companies in general. ERP companies don’t want to watch their price go down every year. If anything, they want to see it go up. If an ERP company were to price in a model like the Windows virtual machine offering on AWS, they would be heading down the path of making ERP into a commodity. And nobody wants to be a commodity. But that’s effectively what Acumatica was doing, pricing by processing power, heading towards a commodity (just not with their AWS SKU). This year Acumatica introduced a pricing model that is based on number of transactions / number of documents instead of processing power (CPU, RAM Memory, and Storage Capacity). The benefit of this new pricing model is that it should be easier for customers to understand. At least that’s the claim. Personally, I think that there is also an aspect here of not wanting to become a commodity which I can totally understand. Interestingly enough, another ERP company moved to this same kind of pricing model this year, at least for a portion of their pricing model. That's the challenge but vendors will work it out. If accountants and lawyers can figure value-based pricing then it ain't beyond the wit of smart brains inside tech companies. Den Howlett is a person who thinks about this kind of stuff a lot more than me. And he’s a lot smarter than me. So I am very comforted by his confidence that ERP companies like Acumatica and SAP will work out something that makes sense based on number of transactions / number of documents. However, I’m a cautious fellow. So I still have a lot of questions about this new pricing model. What do you count as a transaction? Consider a clothing company. One person places a phone order for 1 t-shirt. That’s 1 Sales Order document with 1 Sales Order Line with 1 Quantity. Then a distribution company places a wholesale order for 500 t-shirts, 800 pre-washed jeans with holes already in them, 50 old-school jeans without holes in them (for people like me), and 100 sweatshirts. That’s 1 Sales Order document with 4 Sales Order Lines with a total Quantity of 500+800+50+100=1,450. What should you count as a transaction? The number of Sales Orders (1 vs 1), the number of Sales Order Lines (1 vs 4), or the total Quantity (1 vs 1,450)? Should you consider value? Maybe instead of counting transactions you should total up the amount of the transactions (in Dollars, Euros, etc.). What if Company #1 receives thousands of Sales Orders totaling 2,000,000 pencils for the year at $0.50 per pencil for annual revenue of $1,000,000. Then Company #2 receives 50 Sales Orders totaling 50 cars for the year at $20,000 per car for annual revenue of $1,000,000. Does it make sense that Company #1 would have to pay a substantially higher amount for their ERP system based on transaction volume even though they have the same annual revenue as Company #2? Company #1 should probably pay more than Company #2 because they are using the ERP system a lot more, but how much more should they pay? Note: I’m skeptical of value-based pricing models with ERP because it seems a lot like a revenue-sharing model to me and it would seem very presumptive of an ERP company to think that they are so valuable to the business as to warrant a percentage of revenue. Should certain documents be weighted more? If you are counting transactions, should 1 Sales Order be counted the same as 1 Shipment or 1 AR Invoice or 1 AP Invoice or 1 Journal Entry? Maybe the Sales Order should be weighted higher, but how much higher? Should pricing be based on industry? Den Howlett suggests this in his article linked above. This is a huge area. I think it makes a lot of sense to do it this way, but it’s also a lot of work to develop and maintain so many different pricing models, especially for ERP players who are so used to thinking horizontally and getting into many different industries. With both Acumatica and SAP, the pricing models feel primitive to me at best. It feels like the first step in what will likely be a long journey. To Den’s point in the tweet above about the “wit of smart brains inside tech companies”, they might be able to figure it out. But how long will it take? SAP is huge. They have the cash to weather a potential long journey. But Acumatica is still pretty small. Can they weather this potentially long journey? How quickly can Acumatica develop this new radically different pricing model into something that makes sense for a large variety of different scenarios? My biggest concern is that they might give up and revert to something like pricing per user (I hope not). Will we one day see ERP companies price this way? Acumatica was very close to doing this (just not the hourly component), but this year they changed course. I mean, doesn’t it make sense that you would pay based on the amount of work that the computer is doing? Isn’t that the best measure of how much the ERP system is being used? More and more the processing power isn’t being consumed by people typing information into the ERP system. More and more transactions are coming in automatically, fed by another system or IoT device through an API. More and more, data is getting extracted into a Business Intelligence application or Machine Learning algorithm for analysis. All of this requires processing power. So what’s so bad about pricing by processing power? Is it really that hard to understand? Will ERP ever be easy to understand? If there is any ERP company out there that would lead the charge into the territory of ERP as a commodity, I think it’s Microsoft. The new Dynamics 365 offering from Microsoft seems to be heading in this direction as far as I can tell. Microsoft isn’t as afraid of becoming a commodity. They already did this with SQL Server, potentially a more complex product than ERP. Currently, as far as I know, Dynamics 365 is being priced per user. But will we see Dynamics 365 eventually get priced in an hourly processing power model like SQL Server and Power BI Embedded? And, if Microsoft does this, will other ERP companies be forced to follow? Is ERP as a Commodity Bad for Consultants? I know that many of the Dynamics GP (formerly Great Plains) consultants out there hate Microsoft because, after acquiring Great Plains, Microsoft kept lowering the price. It was a per user pricing model, but the price per user kept going down, effectively turning Dynamics GP ERP into a commodity. This was bad for consultants because there used to be a general guideline that $1 of software cost roughly equated to $1 of consulting cost. But isn’t that dollar for dollar guideline obsolete now with SaaS pricing anyways? I think it was intended for when companies bought software and then paid maintenance on it. And when are value-added consulting service fees ever based on the cost of the products that they utilize? I’m pretty sure that the most expensive consulting services from companies like McKinsey and BCG primarily leverage two basic software products: Excel and PowerPoint. Is there any correlation between the fee for the consulting service and the cost of the Excel and PowerPoint software? Not that I’m aware of. A bit of a jump here, but I assume that the cost of making a basketball has gone down significantly in the past 20 years. And yet the average salary of an NBA player has risen dramatically. The ball might be a commodity, but the money earned by the person who knows how to use the ball is not impacted. If ERP becomes a commodity, why should the money earned consultants who know how “play ERP ball” be impacted by the price of ERP software? This post is getting long so I’ll end it here. Again, these were thoughts from a person who hates pricing and thinks it’s evil. I’m a complete rookie in this area. But I have to admit that pricing is fascinating and it was fun to write this post. Maybe I should be called an “ERP Hippie”. Also, I’m not sure that I’m in favor of any one pricing method over another. These were just some thoughts to consider. Whatever happens, I just want to see Acumatica keep adding customers because it’s a fun product to work with. Here’s hoping that Acumatica succeeds with their new pricing model.